Led by experts from School of Biomedical Sciences (Dept. Biochemistry & Molecular Biology), the new Australian Cancer Research Foundation (ACRF) Facility for Innovative Cancer Drug Design will harness structural biology to discover innovative cancer drugs in Melbourne. 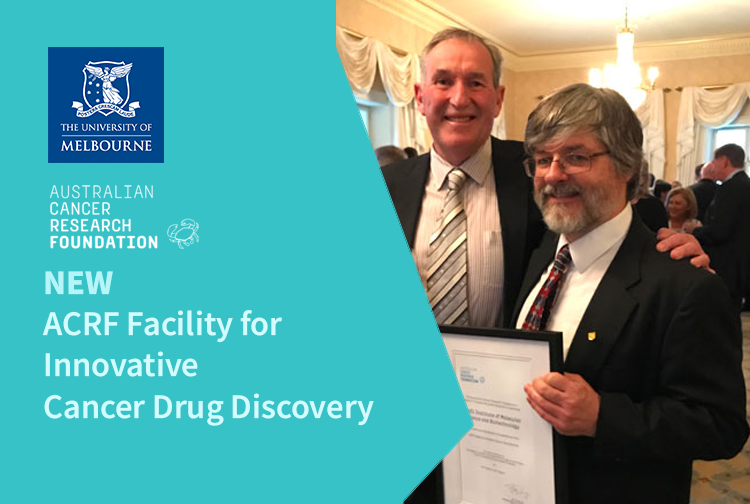 The Australian Cancer Research Foundation (ACRF) will provide $2 million to fund the creation of the ACRF Facility for Innovative Cancer Drug Discovery at the Bio21 Institute, University of Melbourne. The chief investigators, Professor Michael Parker and Dr David Ascher of Bio21, Professor Rick Pearson of the Peter MacCallum Cancer Centre and Professor John Silke of the Walter and Eliza Hall Institute, represent some of Victoria's major cancer research institutions. Professor Parker said: "The ACRF funding will make it possible to create a facility that houses some of the most cutting-edge structural biology instruments and technologies to cater for the cancer research community in the Melbourne Biomedical Precinct and beyond. It will provide our partners with powerful tools to develop and deliver new cancer drugs to patients. Structural biology has played a key role in targeted molecular medicines including imatinib (Gleevec) to treat myeloid leukaemia, venetoclax for leukaemia and gefitinib for lung cancer. "Structural biology holds the key to developing innovative cancer drugs by providing detailed information about the shape of molecules that are involved in cancer-causing biological signalling pathways within cells of our bodies," Professor Parker said. ACRF chief executive Professor Ian Brown said: "The ACRF is proud to be providing the ACRF Facility for Innovative Cancer Drug Discovery with state-of-the-art equipment for the identification, development and delivery of drugs for cancers in this era of personalised medicine where there is currently no therapy available or where improved treatments are required. Structure-based drug delivery offers great potential to hasten advances to improved patient outcomes." The grant was announced at a reception hosted by the Governor General of the Commonwealth of Australia, His Excellency General the Honourable Sir Peter Cosgrove AK MC (Retd) and Lady Cosgrove, at Admiralty House in Sydney on Wednesday 28 November 2018. The Bio21 Institute of Molecular Science and Biotechnology aims to understand human health and disease at the molecular level and improve patient outcomes through biotechnology. It is home to more than 700 research scientists, making it one of the largest biotechnology research centres in Australia. The Institute has major analytical and imaging technology platforms providing world-leading capability to researchers in the Melbourne Biomedical Precinct. The Australian Cancer Research Foundation (ACRF) supports Australian cancer research to end all types of cancer. ACRF funding for cutting-edge technology and infrastructure aims to speed up discoveries in the prevention, diagnosis and treatment.